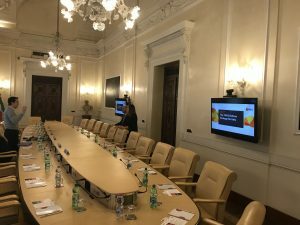 On March 5th, on the day after the Italian general election, Coordinator Mark Sanders and FIRES-researchers Luca Grilli and Erik Stam attended a policy round table co-hosted by Rome based Cassa Depositi Prestiti. Here you find the slide show and policy brief that were presented. 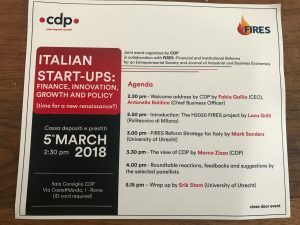 In a lively discussion the state of the Italian Entrepreneurial Ecosystem was discussed and the participants evaluated the FIRES-approach to formulating a tailored reform agenda. In general the attendants appreciated the broad and holistic approach in the FIRES-proposals, but also proposed some important elements were missing. Given that the discussion with policy makers is an integral part of formulating a complete and effective strategy, the round table illustrated that this last step: engaging with policy makers and local specialists, is not to be underestimated. The full report on the policy round table can be found here (later).